When you take the Eurostar, your passport is stamped twice – once at the French border control, and once at the English border control, 10 metres later. The French don’t care – a ‘bonjour‘ and a stamp and I’m done. Some times they omit the ‘bonjour‘. Today, the man didn’t even look at me to see if I resembled my photo (probably a good thing – it was taken when I was 20. Yesterday, one of the teachers at worked guessed that my age was 27. I’m 24 – not happy). With the English, it’s an entirely different story. “How long are you going to the UK?” the woman asks, pursing her wide mouth. “I’m visiting friends for Christmas,” I replied (seriously, why else would I be travelling now?). “I’m coming back to Paris.” At this, the woman looks at me suspiciously. “I’m on a Working Holiday Visa,” I explain. “Yes . . .” I’ve been asked this a couple of times and I’m not really sure what the point is – it’s not like there’s a limit on the number of Working Holidays you can take, and many people take more than one. She continues looking at me. The new tactic? Bore her into submission! It seems to work, and when she asks, “and what age are your students?” she sounds a little resigned. “Oh, they’re adults,” I reply cheerfully, “so I have some in their 20s, others in their 40s, and others in their 60s, though I don’t usually talk about their age . . .” I babble and she purses her lips again. I’m not sure if she’s repressing a yawn or a smirk. “Okay, go,” she tosses my passport back to me. I resigned from my position at BTL today. Renée picked up a pen and notepad and we went to one of the class rooms. “I’d like to resign,” I said brightly (on reflection, I probably used more enthusiasm than was necessary). “Okay. You do know that you need to give two months’ notice? So you would be leaving in February,” she noted the date in her book. My confidence seems to come in waves – I was very confident in and immediately after London, but I think I lost some of that back home, and I definitely wasn’t in the best place when I arrived in Paris. It’s so nice to hear that it’s now coming back. Le meilleur chocolat chaud à Paris? Last night I had hot chocolate at Café de la Paix at the Intercontinental Hotel. Located right outside metro Opéra, it was very expensive (luckily I wasn’t paying, but Google told me the chocolat chaud is €8), and very beautiful – bathed in yellow light, the ceilings were painted, there were golden columns around the room, the tables were set with white linen tablecloths and sparkling glass-wear and the chairs were backed with deep-red velvet or leather, depending on the section. When I was invited to have a hot chocolate on a Sunday evening, I was expecting a more casual affair, so I tried to walk behind my friend so the waiters wouldn’t see my sneakers. No one commented, but I did feel as though I should have dressed up. We sat on leather armchairs in the bar/lounge, and ordered two hot chocolates. We were served with two teacups on saucers, a bowl of sugar cubes, two small, stainless-steel teapots and two long glasses of water. I inhaled the heady scent as I took my first sip, and actually moaned in delight as the chocolate coated my mouth and my throat. It was incredibly intense, and I soon understood why it was served with water – it was so rich that I started drinking it teaspoon by teaspoon. A teapot of chocolate and two glasses of water later, I left very happy. I’m happy to recommend this as the best hot chocolate in Paris, but if anyone has one they want me to compare it to, I’m happy to do the legwork. 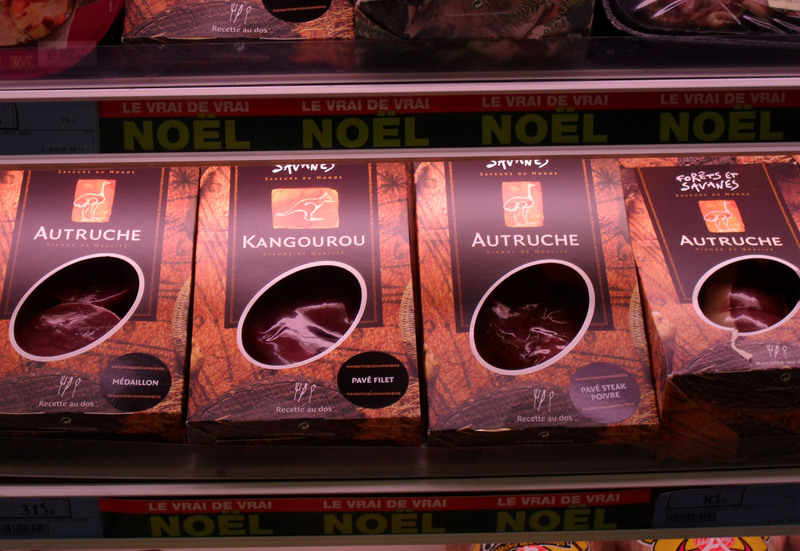 This isn’t Monoprix’s usual stock – these are in the special Christmas section near the foie gras and finger food. Often derogatory, this expression is used for absentminded, dizzy or forgetful people. In English, a linotte is a linnet, which, according to Google, is a type of bird. Guess who called me this? On Thursday night I came clean to Bénédicte about my burnt bedding. I quickly vacuumed the apartment before she got home, then tidied my room. I didn’t want her to catch me watching Friends in French before I confessed. When she came in, she called out “bonsoir!” and I replied. I waited for her to settle down a bit, staring at myself in the mirror, trying to busy myself with arranging papers and sorting my moisturisers, etc., into height order. I breathed deeply. My hands were shaking and my heart was beating heavily. But I’d already said that I was going to in my comments! No turning back. “Bénédicte, je doit parler avec toi,” I said rather quickly. “Oui?” she stood in my doorway. I nodded quickly and unfolded my bed from the wall, and showed her the blankets. “Oh la la!” she gasped (yes, some people actually do say this here, but it sounds more like “aww law law”). “I’ll replace them, or give you the money, as you prefer,” I said as she inspected the damage. “Do the lights still work?” she asked. “Yes,” I demonstrated. What I hadn’t realised was that the lights had been burnt into the wooden frame of the bed, so now they can’t be replaced when needed. “I’ll replace them,” I repeated. Bénédicte sighed and started to leave the room. At the doorway, she turned back with a hand on her hip. “Tu as une peu tête de linotte,” she said. I know – I’m a bit of a featherbrain. A few weeks ago I wrote about spilling nail-polish in the bathtub and was panicking about cleaning it up before Bénédicte got home. As I’ve just made the biggest screw-up in any of the houses where I’ve lived, it might be time to tell you about Bénédicte, and maybe you’ll understand the reason for my panic. Bénédicte is my flatmate, though the fact that she is also my landlady and I pay my rent to her means that our relationship is completely different to the relationships I’ve had with my former flat and housemates. The apartment is hers. I never use the living room, and I feel uncomfortable using the kitchen when she has friends over. Although she has never spelt it out, the arrangement is very clear – this is her apartment and I am a guest. This means I need to follow her rules. This is fine, though she seemed to assume that I would automatically know the rules without being told. For example, when I arrived I would wash my dishes and leave them on the sink to dry. A week or two later, she told me that I couldn’t do this because the cat’s water was on the sink, and she was too scared to climb up and drink it if there were things drying there. Fair enough – don’t leave the dishes out. Still not sure how she expected me to know that. Also, the bathroom. Here it seems to be very popular for people to have showers without curtains or doors. Bénédicte’s is essentially a large bathtub with a shower-head attached to the tap with a hose. This means the floor can get a little wet. I soon got a lecture about drying up the water after myself so she wouldn’t get mould and mushrooms. Again, fair enough – but with which towel? Having had a couple of incidents like this, I was hoping to wait until we had a good relationship before I told her I broke the folding chair in my room (it made a strange noise when I sat, and when I tried to fold it flat again, one of the screws broke). I broke it in the first half of October. I still haven’t told her. The week I got back from Croatia was a bad one – I arrived at 12:30am on a Sunday morning. When you leave the keys in the inside keyhole of our front door, no one can unlock it from the outside. When I got home, my key wouldn’t turn because hers was on the inside, so I had to ring the bell and wake her and her boyfriend up. A few days later I (very stupidly, I know) left the stove on in the kitchen. In all honesty, it was on a low setting and I would have seen it the next time I went into the kitchen, and Bénédicte saw it about ten minutes later, but it was still pretty idiotic, and I got a talking-to about having to be more careful. Then, in the same week, apparently some of my food was touching the back of the fridge, and this caused the fridge to leak onto the kitchen floor. Bénédicte was furious! Visibly trying to keep her voice down, she beckoned me to the kitchen and pointed to the fridge and to the floor and told me about how I had to pay attention, and how disgusting it was, and how I was creating so much more work for her when she did all of the cleaning, etc., etc. That has been the low point to date. After she left I cleaned the entire apartment, and have tried to be on my best behaviour ever since. I even thought it might be possible for us to have some sort of relationship, so that these things wouldn’t be such a big deal (because, let’s face it, I can be extremely absentminded, and it can be charming once you like me). Patrice, a guy I’ve been having Conversation Exchanges with for the last three weeks, suggested cooking her dinner once a week, so we could talk. I went home happy, thinking about what a good idea it was and feeling optimistic about Bénédicte’s and my relationship. I set my things down in my room and turned on my laptop. Bénédicte knocked and poked her head in. “I came into your room earlier and cleared this shelf for you, so you can use it for your things,” she said. What? I raised my brows; she came into my room when I wasn’t home? “Okay,” I said and she left. I felt violated. She went into my room when I wasn’t home. I only had one room in the apartment, and part of what I felt I was paying for was privacy. No – I didn’t think a real relationship would be a possibility after all. So, for the past three weeks we’ve been coasting along on a fairly neutral standing, and I was just waiting for the opportunity to tell her about the chair. Then yesterday, she came home and knocked on my door, handing me my key. I’d left it in the keyhole outside. Okay . . . maybe I’d wait a couple more days before I told her about the chair. But that was nothing, compared to what I did today. I can’t believe how stupid I was! Even for me, this was beyond . . . I don’t even know what it was beyond. I have no words. I came home after work and my room smelt strange. I couldn’t figure out what it was – I smelt the curtains, the carpet, my clothes, but didn’t know where it was coming from. I sprayed around some air-freshener and opened my windows for 15 minutes, and promptly forgot about it. Until I unfolded my bed for the evening. My bed folds into a rectangular hole in the wall. At the top of this hole are two down lights that I usually turn on when I’m tucking myself in for the evening. I didn’t turn them off before I left for work this morning. The lights had been on all day, with the foot of my bed pressed against them. And there are now two black holes in the foot of my bed. The top blanket has been burned through, as has the top layer of my doona cover. The doona has two brown holes gouged out of it and the other side of the cover has two black circles. The fitted sheet and mattress protector underneath that have brown circles, and even the mattress has a mark. Hole in my bedding - think she'll notice? 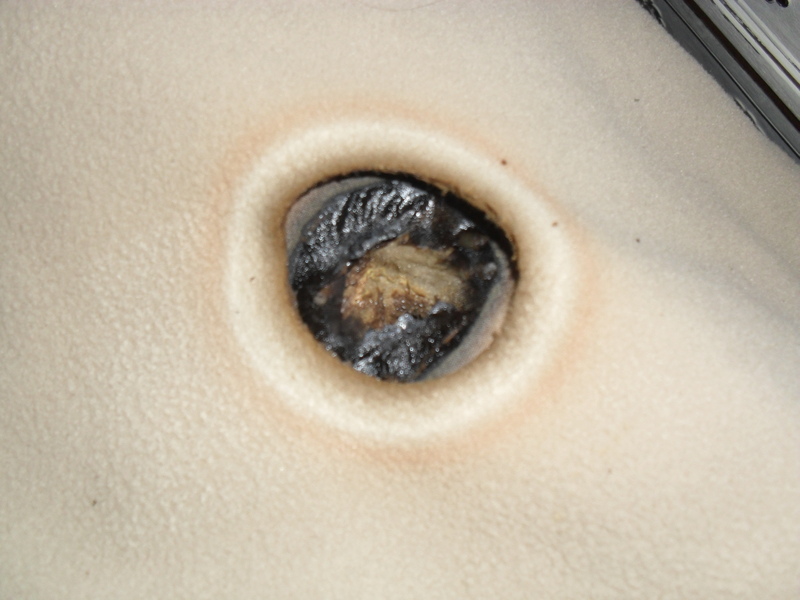 The smell was my bed burning. I suppose I should be grateful I didn’t start a fire, but at the moment I’m panicking about what to do. Should I tell her now and risk being kicked out? Should I wait until I move out and risk losing my deposit (which I really need for my travel budget)? Should I buy new bedding and try to dispose of the old stuff discretely? And I still have to tell her about the chair. *It was a glass ring. And I am a clean person, it had just been a busy week and I’d been out all Saturday, and hadn’t gotten around to it yet. I last got my hair cut in Australia, six months ago. So, it’s been in need of a cut for some time, but my lack of hairdresser vocabulary had been putting me off. Today, Julia (another Aussie at BTL) and I took the plunge and went to the Tchip on Boulevard Sebastopol. Tchip is a chain of cheap hairdressers in Paris – a cut and blow-wave is €19, add a colour and the total is €29, have foils instead of an all-over colour and it comes to €39. Given that some places charge €70 for a cut, it seemed like a good idea. It’s about four hours later now, and it doesn’t look like I’ve had anything done. I just wanted the split-ends taken off and some layers around my face, but the girl didn’t cut it short enough. I actually commented on it when it was done – “je veux que les fins être saines – est-ce que c’est assez?” (I know, bad grammar, I need to practice more). So much for le client est roi. Oh well, it should be enough to last the next six months! I’ll deep condition it this weekend – it will be fine. Most of this I knew, though lisses, soin and bouclés were new. The hairdresser asked if I wanted my blowdry lisses or bouclés, and I chose bouclés. What I didn’t realise was that her definition of curly looked as though I had woken up and brushed my hair upside-down, then hair sprayed it upside-down, and then gone for a walk in the wind. I brushed it out as soon as she finished. Now that I know it, I quite like the word bouclés. I already knew the term boucles d’oreille, or earrings, so now I think of gold earrings as small, golden curls. Boucle also means buckle . . . buckled hair? Well, if you think of someone’s knees buckling, or someone hunched over a desk as they buckle down to finish their work, I suppose you could also translate les cheveux bouclés as bent hair, which is pretty accurate. The verb boucler can also mean to close or to shut (e.g. : boucler la maison), and what is buckling a belt or a shoe if not shutting it? What can I say – I like words. I’m an English teacher. *Please see Expatica for a more comprehensive list. Why don’t men ever listen? I had a solution. It may not have been elegant, but it was simple and quick. Instead, he decided to rebuild his laptop because the DVD wasn’t playing properly. Yesterday I had my last lesson with Jean-Phillipe. Jean-Phillipe is one of my most frustrating students. Yes, he’s a nice guy, but he is on a book that’s too advanced for him and, no matter what I try, he never seems to progress (this probably says more about my teaching than about him, but I’m starting to think that some people just can’t learn languages). As I didn’t have much inspiration for his last lesson, I asked if he could bring in a laptop and then we could watch some English TV episodes with French subtitles. I arrived at the office 10mins early. 10mins later, reception managed to contact him and sent me up to the 8th floor. Our usual room was locked, so I took a seat near the elevator while I waited for him to arrive. After another 10mins Jean-Phillipe appeared, and hooked us up with a room 5mins later. He set up the laptop and I started the DVD, praying that the subtitles would work. They did. The sound didn’t. Jean-Phillipe unmated the computer. He turned up the volume on VLC. Nothing. He opened it in Windows Media Player – this time there was sound, but no picture. He tried RealPlayer and QuickTime – picture but no sound. “Why don’t we just open VLC and Windows Media Player and play them at the same time?” I suggested – not brilliant, I know, but we were already over half-an-hour through the lesson. Jean-Phillipe said nothing. He played with some more settings, opened and closed the file a couple of times, re-started the computer and tried it again. “I go to get a new disk,” he said. “Why don’t we just play the two together?” I asked again. “No, it’s at my desk,” he said. Five minutes later he came back with a new hard disk and switched it with the old one. He started up again . . . it worked! 45mins through the lesson we got started – my way would have been much quicker. After one and a half episodes of Chuck, Season 1, we finished the lesson. Having really enjoyed it, Jean-Phillipe asked if he could copy the files and return the disk to me in reception. 15mins later, I was still waiting. Today I visited the Panthéon, and I think it may be my new favourite Paris monument. I’d only seen it from the outside before and, knowing nothing about the building, had always assumed that it was some sort of national assembly. 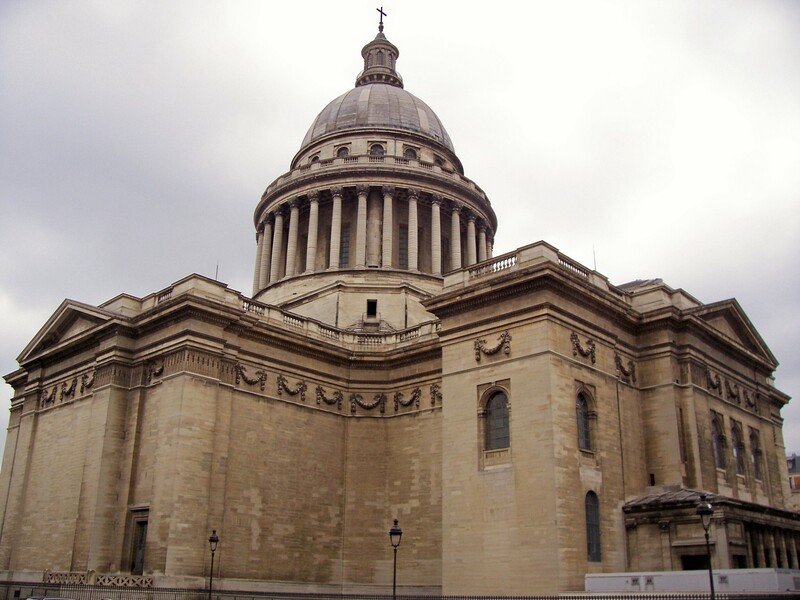 Originally the Panthéon was intended to be a church, and Jacques-Germain Soufflot was commissioned to design it in 1755. The foundations were laid in 1758, and the building was finished in 1789, coinciding with the start of the French Revolution. Thus, the Revolutionary government ordered it to be changed from a church to a monument to great Frenchmen. Since then it has been through a political and religious tug-of-war, twice being changed back to a church, only to again become a monument to French intellectuals. Not knowing any of this when I walked in, I was surprised at the mesh of different atmospheres – the building looks like a church. It is made in the shape of a Greek cross and the dome is reminiscent of St Paul’s in London or St Peter’s in Rome. But many of the paintings on the walls (separated from the central area by a wall of columns) are not religious, and neither are the statues. And, on a quiet Sunday afternoon, it felt like I was walking through an ancient, cavernous library. It was only when I went down into the dim, echoing crypt that I learned of the history of the building, and when I returned to the main level I tried to look at all of the changes that were made as the building changed identities – many of the windows have been blocked in, so it’s darker than many churches of this style, and though many of the main paintings are not religious, the smaller ones above them show angels and saints, and are done in a completely different style with a lot of gold-leaf. 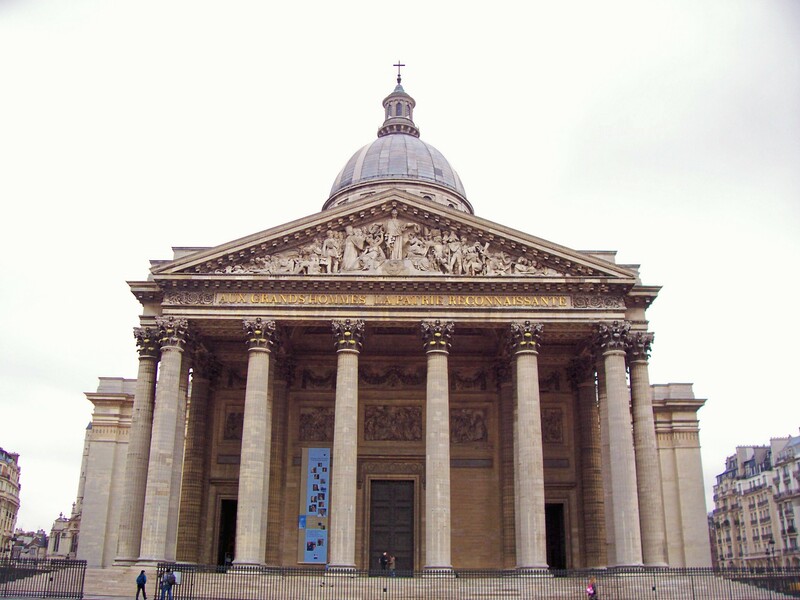 I was so caught up in the paintings that I didn’t actually see the pendulum – one of the things for which the Panthéon is known – until I was on my way out. In the centre of the building, hanging from the dome, is a gold pendulum. It swings back and forth over a table that represents a 24-hour clock face and tells the time by swinging over the hour. The original was built in 1851 by Léon Foucault who demonstrated the rotation of the Earth with the experiment. 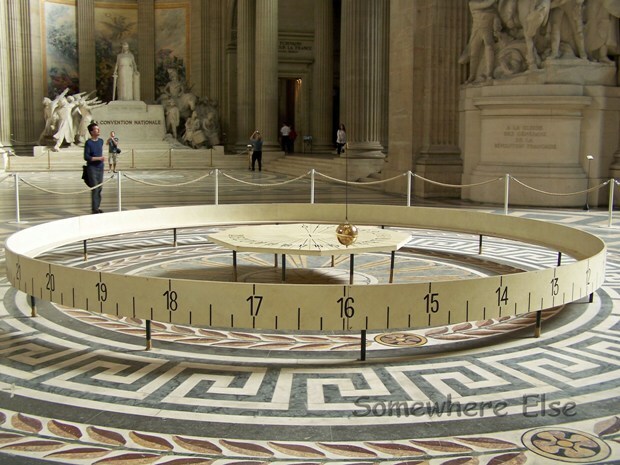 Basically, because the pendulum isn’t touching the Earth, it continually swings back and forth on the same line, but because the Earth (hence the Panthéon and the clock-table) are rotating under it by 11 degrees an hour, the pendulum appears to be moving as the day progresses. Very cool. The Panthéon is one the monuments that has left me awestruck by its size. Maybe it’s because I haven’t looked at many buildings like this for some time, but I found myself staring at the ceiling, unable to comprehend how high it was, or the size of the pillars which line the walls. Even the model with a cross-section taken out was twice my height! Although it isn’t as well-known as the Louvre, the Notre Dame or the Eiffel Tower, I think this is a must-see for anyone visiting Paris.